The topic of thin films is an area of increasing importance in materials science, electrical engineering and applied solid state physics; with both research and industrial applications in microelectronics, computer manufacturing, and physical devices. Advanced, high-performance computers, high-definition TV, broadband imaging systems, flat-panel displays, robotic systems, and medical electronics and diagnostics are a few examples of the miniaturized device technologies that depend on the utilization of thin film materials. 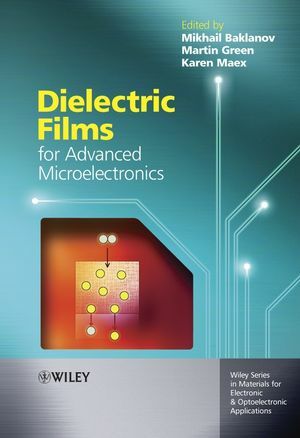 This book presents an in-depth overview of the novel developments made by the scientific leaders in the area of modern dielectric films for advanced microelectronic applications. It contains clear, concise explanations of material science of dielectric films and their problem for device operation, including high-k, low-k, medium-k dielectric films and also specific features and requirements for dielectric films used in the packaging technology. A broad range of related topics are covered, from physical principles to design, fabrication, characterization, and applications of novel dielectric films. IMEC is the largest independent microelectronics R&D centre in Europe, with over 1250 staff. R&D ranges from the design of complex single-chip and single-package systems for telecommunications and multimedia, new process technologies for optoelectronics, photovoltaics, area-array packing, etc. Preface. (Mikhail Baklanov, Martin Green and Karen Maex). 1. Low and Ultralow Dielectric Constant Films Prepared by Plasma-Enhanced Chemical Vapor Deposition. (A. Grill). 2. Spin-On Dielectric Materials. (Geraud Dubois, Willi Volksen and Robert D. Miller). 3.Porosity of Low Dielectric Constant Materials. 3.1 Positron Annihilation Spectroscopy. (David W. Gidley, Hua-Gen Peng, and Richard Vallery). 3.2Structure Characterization of Nanoporous Interlevel Dielectric Thin Films with X-ray and Neutron Radiation. (Christopher L. Soles, Hae-Jeong Lee, Bryan D. Vogt, Eric K. Lin, Wen-li Wu). 3.3 Ellipsometric Porosimetry. (M. R. Baklanov). 4.Mechanical and Transport Properties of Low-k Dielectrics. (J.L. Plawsky, R. Achanta, W. Cho, O. Rodriguez, R. Saxena, and W.N. Gill). 5. Integration of low-k dielectric films in damascene processes. (R.J.O.M. Hoofman, V.H. Nguyen,V. Arnal, M. Broekaart, L.G. Gosset,W.F.A. Besling, M. Fayolle and F. Iacopi). 6. ONO structures and oxynitrides in modern microelectronics. Material science, characterization and application. (Yakov Roizin and Vladimir Gritsenko). 7. Material Engineering of High-k Gate Dielectrics. (Akira Toriumi and Koji Kita). 8. Physical Characterisation of ultra-thin high-k dielectric. (T. Conard, H. Bender and W. Vandervorst). 9. Electrical Characterization of Advanced Gate Dielectrics. (Robin Degraeve, Jurriaan Schmitz, Luigi Pantisano, Eddy Simoen, Michel Houssa, Ben Kaezer, and Guido Groeseneken). 10. Integration Issues of High-k Gate Dielectrics. (Yasuo Nara). Dielectric films for interconnects (packaging). 11. Anisotropic Conductive Film (ACF) for Advanced Microelectronic Interconnects. (Yi Li, C. P. Wong).